In 1972, black consciousness was all over the place - Curtis Mayfield, Marvin Gaye, James Brown, Sly & The Family Stone, The Temptations, The Undisputed Truth. 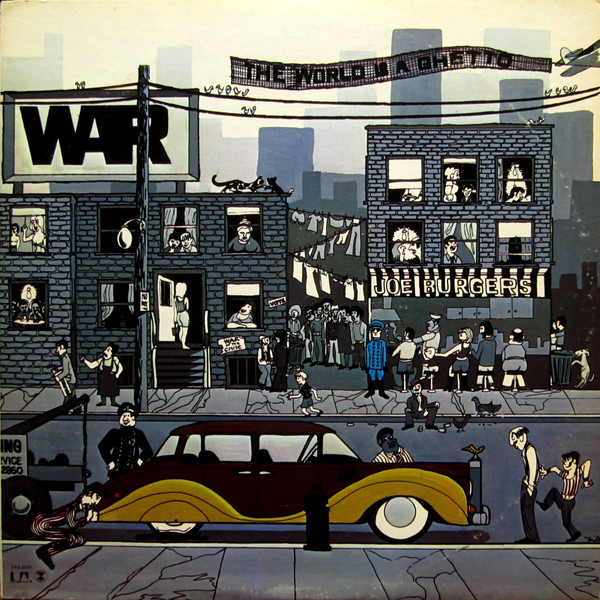 War were another exponent, but they were more of a funk/ jazz/rock outfit as opposed to soul. Along with The Meters and the underrated Tower Of Power, they were one of the great pioneering funk bands. 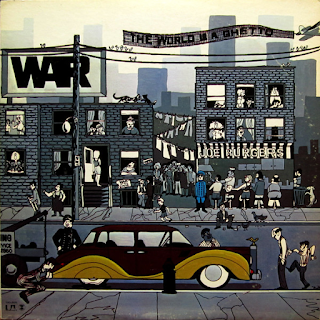 A seven piece full of excellent instrumentalists, this was a superb, cooking album of "blaxploitation" ghetto living early seventies style. 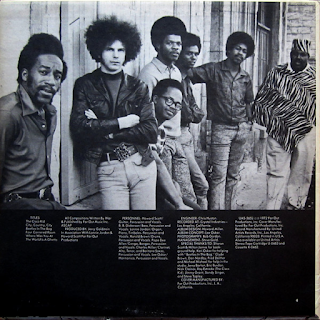 The album only contained six tracks - the pulsating, energising funk of the comparatively shorter "The Cisco Kid" and "Where Was You At" lead us into the laid-back funky groove of "City, Country, City", which meanders her, there and everywhere, seemingly allowing all the members a solo piece, from relaxing, soulful harmonica to frantic jazzy keyboards and funky percussion. A bit like Santana's "Caravanserai" album, this is intense, serious adult instrumental music, nothing remotely commercial about it. The bass, drums, percussion and keyboard passage around ten minutes in is intoxicating. "Four Cornered Room" is an inscrutable, slow-tempo workout, with occasional backing vocals before leading into some dreamy, hippy verses about sitting in my four-cornered room. Then we get a spoken, seventies-style "rap" about consciousness and understanding. For 1972, stuff like really was adventurous and boundary-pushing, both musically, lyrically and conceptually. This cut is brooding, soulful, portentous and sombre. The title track is in its full ten-minute version here. It has a captivating soul vocal and a pulsating, insistent slow groove to it. Throughout this album there are elements of jazz, blues and even psychedelia left over from the sixties. Check out the jazzy saxophone on the title track over that rumbling bass. Brilliant stuff. It doesn't sound at all dated, even all these years later. The album closes with "Beetles in The Bog", a slightly incongruous, chanted vocal number that has a funky rhythm but a bit of a Sly Stone "There's A Riot" era somewhat drunken-sounding vocal. This is a minor thing, though, overall, this was a most credible effort.